Sometimes sorry is not enough . . .
Em loves the winter holidays. And this year, things are really looking up: the guy she's been into for months has finally noticed her. But if she starts something with him there's no turning back. Because he's going out with her best friend. On the other side of town, Chase's home life is stressful and his social life's unravelling. But that's nothing compared to what's really haunting him. For Chase has done something cruel - something the perfect guy he pretends to be would never do. And it's only a matter of time before he's exposed. Mistakes can be deadly. And three beautiful, mysterious girls are about to make them pay . . . This is the first book in a trilogy but titles for the next 2 books have not been released yet. 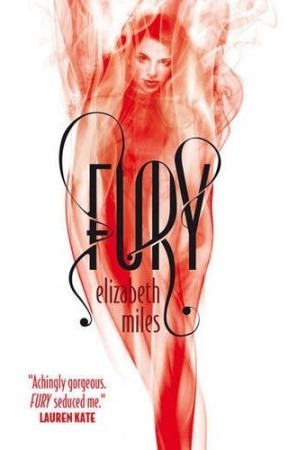 I have been looking forward to reading Fury for ages, as a massive paranormal fan this one was added to my wish list as soon as I first heard about it. I don't think I've read anything aimed at the young adult market that is about furies so I was excited about reading something different from all the other paranormal stories currently out there. Unfortunatley I ended up feeling a bit disappointed with the story and I'm not sure if I would continue reading the series. Right from the beginning I found it really difficult to like any of the main characters. I was really annoyed with Em that she was moving in on her best friend's boyfriend, she made excuses to herself that her friend Gabby would forgive her when she realised how much Em loved Zach but that stupid thinking really annoyed me. Em was acting like a selfish brat and wasn't the kind of friend anyone would want to have in their life. I suppose I should have felt more sorry for Gabby but she came across as spoilt and self obsessed and I really didn't care about her either. As for Zach, he was a complete rat and I couldn't see why either of the girls was attracted to him in the first place. Then you have Zach's best friend Chase who is from the poor side of town but has done everything he can to get in with the popular crowd. He's the star of the football team and uses his popularity to score with as many girls as he can, happy to string several along at the same time. Not really an attractive characteristic. When Chase meets Ty he is immediately drawn to her but I couldn't understand why he didn't find any of her behaviour strange or suspicious. I got to the point where I thought both Em and Chase deserved whatever they got and was actually looking forward to seeing the furies get their revenge. Unfortunately I had to wait a long time to find out what they had planned. As you're reading you know that something will happen but it seems to take forever for the supernatural events to take place. I wanted to find out more about the furies and the mythology surrounding them but that never really happened, hopefully that is something that will happen in the next book. As much as I didn't like Em and Chase I felt that their actions didn't merit the revenge that the furies had in mind and I couldn't understand why they had been picked as targets when some other characters in the book seemed to get away with worse actions. I've said before that I'm not a big fan of the mean popular kids who get away with doing whatever they like so I think that's probably a big part of the reason that I didn't like Fury. I'm sure this story will be popular with some but unfortunately it wasn't for me and I would struggle to recommend it.